The people who live in Dhuvaafaru island today used to live in Kandholhudhoo island, another island in the same atoll. 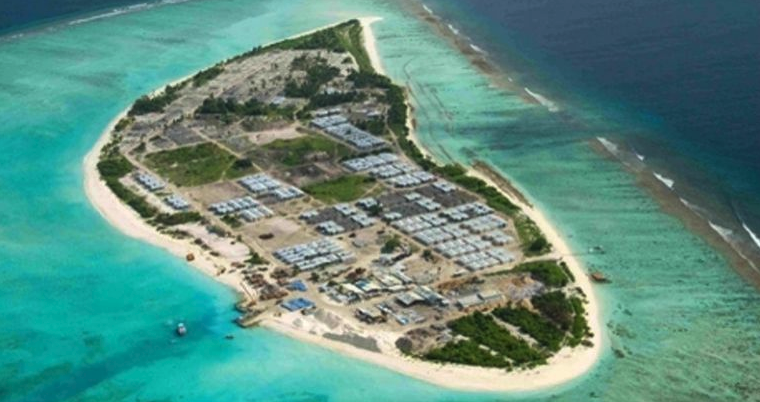 The worst recorded disaster in the history of the Maldives, the 2004 tsunami entirely destroyed the small island community of Kandholhudhoo, damaging homes of 3,600 people and contaminating ground water, making it impossible to live there. 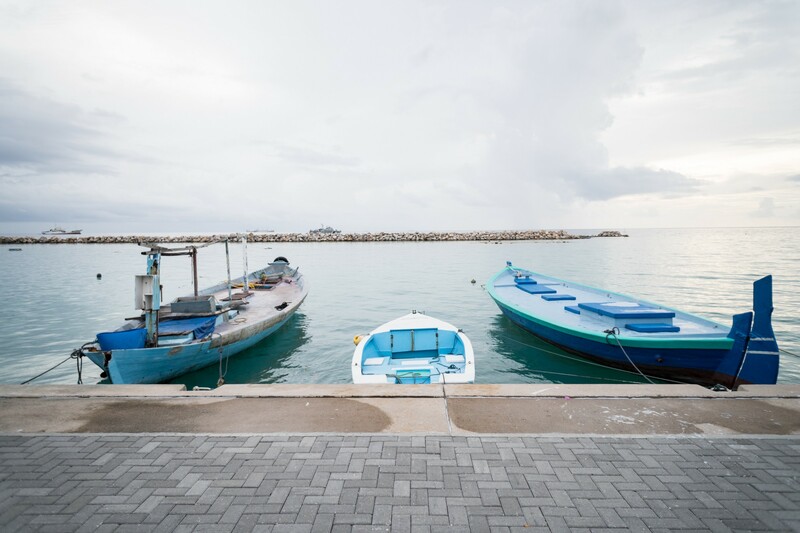 Four years after the tsunami, the traumatized community was resettled in Dhuvaafaru island, where 600 houses were built with the support of the International Federation of Red Cross and Red Crescent Societies (IFRC). Dhuvaafaru meaning “running reef” in the local language lies barely a meter above sea level, across 49-hectares of coral island. A tsunami evacuation drill on 21 March 2018 made many islanders re-live their painful tsunami experience. “A few students panicked when the alert was delivered to the classroom. When I saw them crying, it made me panic as well. It really felt like a real tsunami had struck our island again,” said Ms. Subra, a teacher from India, after the drill. Japan, where I come from, has very clear principles for an evacuation: “O·Ka·Shi·Mo·Chi”- “O”sanai (no pushing), “Ka”kenai (no running), “Sh”aberanai (no talking) “Mo”doranai (not returning), “Chi”kazukanai (not getting close to fire). 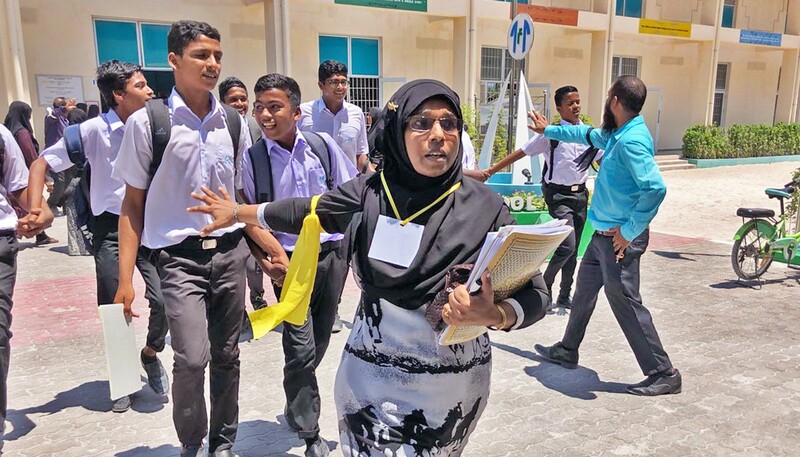 Surprisingly, many students in Dhuvaafaru were shouting and running around during the drill, although they were instructed otherwise in the practice drill a day before. As it was the first drill experience for everyone, more than 20 parents tried to force themselves into the schools’ gym, were the students were gathered, to take their children home. Being reminded of the tsunami threat, mothers were in tears and scared during the drill. This unexpected interference caused a delay in evacuation to the safe area on the 3rd floor of the school. In addition to the basic tsunami training, students and teachers were engaged in a series of workshops, including training on fire and electric hazards provided by the Fire and Rescue Team of Maldives National Defense Force and first aid training by Maldivian Red Crescent. 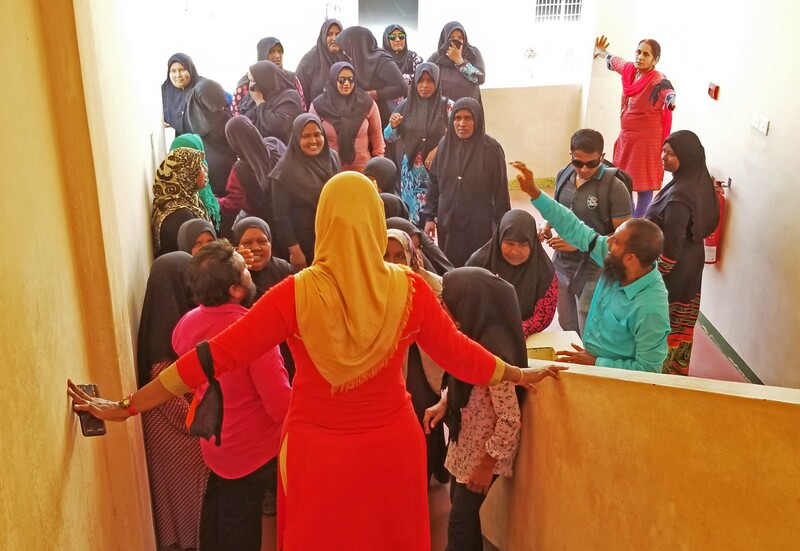 The training for the teachers was conducted in both local Divehi language and English, considering that 40 per cent of the teachers come mostly from South India. Disaster Management officials of the Maldives, and a group of female leaders from Small Island Developing States, were trained in Japan. “In Japan, I visited a school that saved all its students during the Great East Japan Earthquake by evacuating the students to the roof of the school, from where they were rescued next morning. 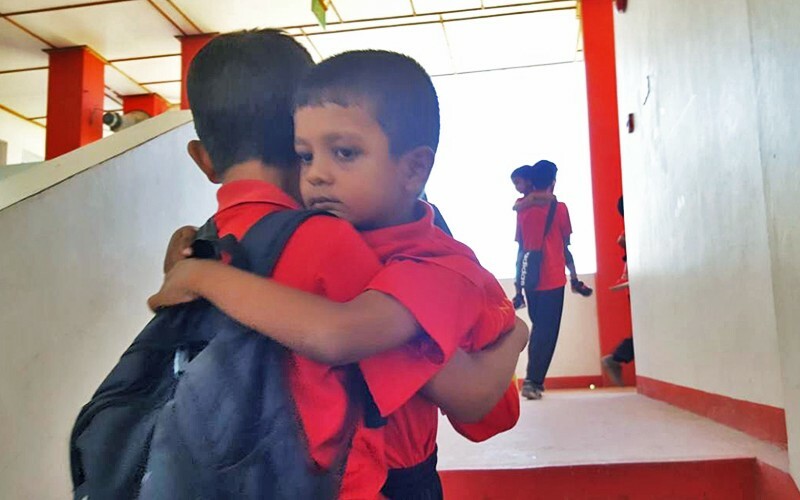 I also visited a school, where majority of the students died due to a lack of evacuation plans,” commented Ms. Sonath Abdul Satar, Disaster Management Officer of the Maldivian Red Crescent, who was in charge of the evacuation drills at Raa Atoll School. “We learned the importance of evacuation drills and plans. As we don’t have suitable evacuation sites in our country such as elevated ground or inlands, we find many difficulties in conducting evacuation drills. Despite these challenges, we would like to prepare for unexpected disasters by incorporating my learning from Japan and sharing it with all the schools and communities in the Maldives, ” Sonath Abdul Satar said. The training on disaster risk reduction was sponsored by the Government of Japan, the United Nations Institute for Training and Research (UNITAR), and the United Nations International Strategy for Disaster Reduction (UNISDR). 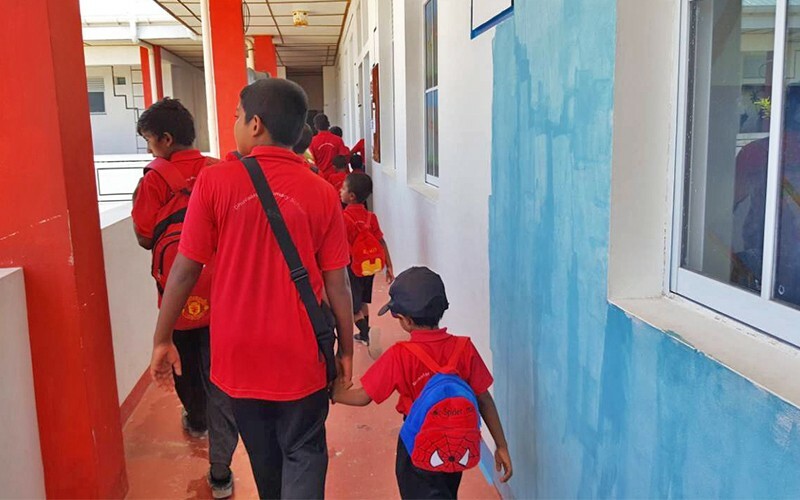 Since September 2017, the United Nations Development Programme (UNDP) in the Maldives has conducted tsunami evacuation drills in six schools in five atolls, with 3,098 students and teachers participating. The drills were supported by the Maldives National Defense Force, National Disaster Management Centre, Maldivian Red Crescent, and the Maldives Police Service, who executed a complete tsunami education programme to the students, teachers and community members. I was born and raised in Japan where natural disasters are frequent, and I regularly participated in evacuation drills in my school. It was very special to experience the evacuation drills in the Maldives, where culture and topography is vastly different from Japan. It made me realize that some common guides such as “evacuating to higher grounds” or “no running” are actually difficult to implement in the Maldives. The nation of islands is comprised of 184 tiny inhabited islands, that lie 1–1.5 above the sea level. All islands are vulnerable to natural disasters such as Tsunamis. In order to institutionalize evacuation drills, which can save lives at times of disasters and make sure that everyone is able to evacuate safely, I would like to continue working for implementation of such drills in the Maldives.